Add into the presentation blend a two guest to one professional guide delivery service standard ratio via only the 'longest toothed' professional River Tay guide team staff makes for instant duplication of the required salmon fishing skills for any non fishing background participants and your day is off and running! Beautifully balanced salmon fly rods, reels and lines are supplied by our professional salmon guide team along with chest waders, waterproof jackets, life jackets and all other required salmon fishing kit so no one needs to bring anything if wishing to travel light. Great cuisine tastes even better while overlooking Scotland's largest and most famous flagship salmon river. Having worked for many years with professional chef Jeremy Wares there's few who can match his renowned standard of culinary brilliance. Jeremy is the man indeed to pull off spectacular riverbank lunches and transform any fishing hut into a luxury restaurant! There's always a huge surprise when entering the fishing hut after the morning fishing session when Jeremy is on site! 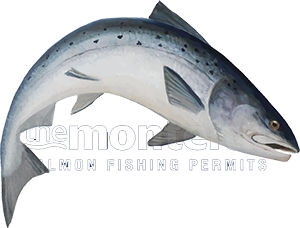 All salmon fishing event days include the use of a high quality River Tay salmon fishing venue so you've got full control of the water and fishing pool rotations for your salmon fishing event day. This basically means that all the 'hot spot' salmon lies belong to your group for the day which always increases the chance of salmon action. Total 'exclusivity' of the fishing venue and fishing hut truly sets the mood for a 'personal' high quality River Tay salmon fishing event experience. There are great hotel options in the Tay Valley for accommodation for the evening prior to and or following your salmon fishing event day and the beautifully refurbished Dunkeld House Hotel is most definitely one of the top contenders being positioned within 70 yards of the river. Since the hotel was privately purchased a few years ago the new owner and his superb management team have 'raised the bar' and do an excellent job at making sure our fishing guests are made exceptionally welcome and are well looked after. If football, golf, tennis or whatever other form of corporate hospitality is becoming a bit monotonous for your valued business associates then consider a day trip into the natural riverbank beauty of the Tay in pursuit of the 'King of Fish'. There's nothing I've ever personally seen that tops the intrigue & excitement of the salmon river and especially one as famous and naturally brilliant as the Tay. Follow this link for more information on a River Tay salmon fishing event experience.